i haven't even HEARD of this trend yet- you are so awesome for making this post! 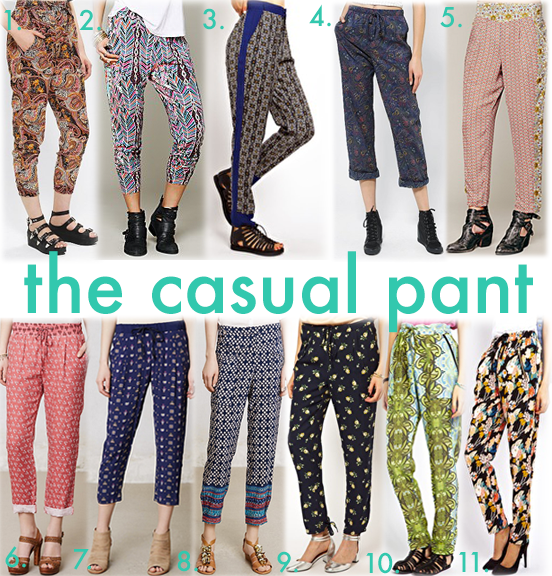 pants that are fancy but feel like sweats? sign me up. and i love all the crazy cool ones you picked out- that second to last one is my faaave! I love the pants, but I cant embrace them myself. I end up looking like a cross between Princess Jasmine in Aladdin and a girl who forgot to get dressed! hahaha, princess jasmine! i totally know how you feel! i think it's really important that you find some pants with a print that makes you feel comfortable. if you dont want to seem put together wearing them with heeled booties or some heels might help you dress them up? Quite Crafty: Renegade Craft Fair L.A.